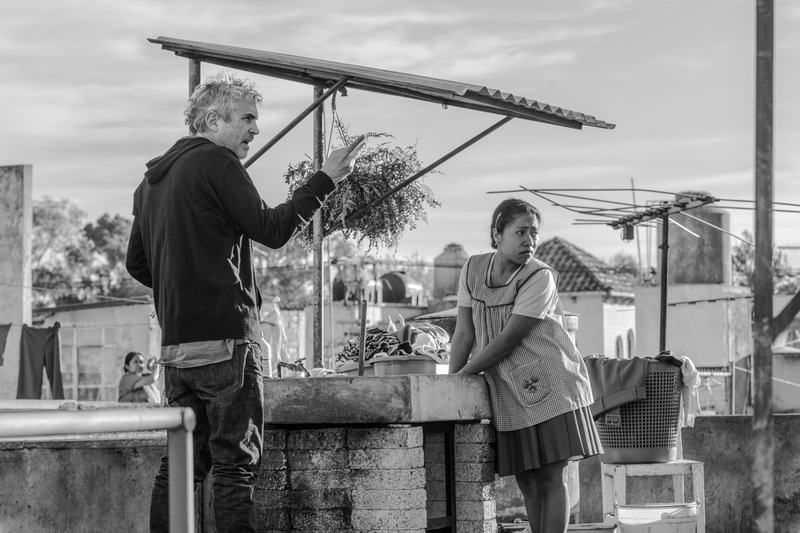 Topping most of 2019’s film awards lists and with an overwhelming media presence, Alfonso Cuarón’s Roma has inaugurated a set of much needed, if late, conversations about domestic labour, racism and gender issues amidst a deeply fractured Mexican society – and to some extent globally due to its tackling of the gendered and racialised politics of domestic work. Internationally known for films such as Children of Men (2006) and Gravity (2013), the fifty-six-year-old Mexican director had earlier undertaken his country’s social problematics in his debut film Solo con tu pareja (1991) and in Y tu mamá también (2001). Both these films, however, mainly focus on the conflicts of young, middle-class Mexican males, with gender and racial issues only addressed indirectly. Roma, conversely, turns around some quite different characters and subjectivities. Set in Mexico City in the early 1970s, the film is a reflection on a convulsive period of Mexico’s history and weaves a domestic realm story that focuses on the indigenous maid Cleo and the vicissitudes of the upper-middle-class family that she serves. The film succeeds in conveying the intricate dynamics of power and affection behind the instrumental fact that Mexican maids have historically been at the same time workers for as well as members of bourgeois nuclear families. The emotional link between the live-in servant and the four children of the house is the inspiration for the film, and Cuarón was motivated by an autobiographical impetus as he based the character of Cleo on his own childhood nanny, Liboria Rodríguez. Notwithstanding this, it is the interaction between Cleo and her patron Sofía that is actually the most revealing one in Roma. Both women experience parallel dramas of abandonment by men, yet the tremendous gaps between the darker-skinned indigenous servant and her wealthy, phenotypically European patron reveal plenty of dilemmas regarding the conflictive relation Mexico has had with modernity, at the same time as the film is an intimate approach to the hierarchical, exploitative, and racist, Mexican society. Filmed in a silky-textured, digital black-and-white, the photography provides an evocative aura from the very first moment. Deep focus and long takes with lots of panning allow Cuarón (who is his own photography director in the film) to create fully detailed and immersive environments that are staged with theatrical precision. Production designer Eugenio Caballero accurately recreates the 1970s décor to the point of obsessiveness, while Sergio Díaz’s sound design fully conveys the rich and vivid soundscapes of Mexico City. The film’s aesthetics is therefore emotionally appealing inasmuch as it succeeds in creating affective surroundings instead of mere historical settings. The first sequences clearly present the intimate universe of this bourgeois urban family. Firstly, there are the maids: constantly in a hurry, Cleo cleans up the yard where the family dog poops, picks up the clothing from the bedrooms to do the laundry, and collects the youngest child, Pepe, from the kindergarten. Adela, Cleo’s fellow maid and roommate, manages the kitchen. Both girls constantly chat and giggle in Mixteco, their indigenous mother tongue from southern Mexico. As lunchtime approaches, the remaining three children come back from school, accompanied by their live-in grandmother, Teresa, and a driver. Sofía, the mother, comes in later to join the family lunch; she is the commander and manager of the household duties, but she does not carry them out. Cleo serves the meal but does not share her patron’s table; rather, she eats in the kitchen with Adela and the driver. In the evening, the pater familias makes his macho-triumphal entrance, yet throughout the film the character of the father remains completely underdeveloped (both diegetically and extradiegetically, his arrival is given relevant treatment, but the jump-cut editing only shows his hands as he attempts to get his large Ford Galaxy car through the house’s narrow driveway). After the family have had their dinner in front of the television, the children go to bed and Cleo sings them softly to sleep in Mixteco. Sofía and her husband have an argument, which Cleo can only hear in the distance while she finishes clearing up the TV room. When she finally joins Adela in their shared room, they joke and do their exercises by candlelight before going to bed (they mention that señora Teresa demands that they keep the lights off in order to save energy). As the story moves forward, Cleo’s sweet nature and receptive meekness, as well as her stoicism in tirelessly performing physical work, prove to be pivotal for the family’s wellbeing after the father abandons them. Yet, as she goes about her tasks Cleo herself must also face the neglect of her boyfriend after her unintended pregnancy. The character of Cleo is beautifully performed by the non-professional actress Yalitza Aparicio, while Adela, the other maid, is played by Nancy García, who is actually Aparicio’s best friend in real life. Both women are originally from the southern state of Oaxaca, one of Mexico’s cultural and demographic indigenous epicentres. They are both also Mixteco native speakers. The presence of phenotypically indigenous women performing leading roles, as well as the incorporation of their languages, is very rare in Mexican mainstream cinema, where actors have historically had better professional chances the whiter they are. Roma and its protagonists have thus been deservedly celebrated by the media, in light of the implications that this casting choice might represent for the highly racist, local star system, and, in more general terms, at a social level. Mexico has been a little delayed in coming to this ‘inclusive’ scenario, however. The focus on indigenous female dramas is nothing new in Latin American cinema. Female indigenous subjectivities have been explored cinematographically, to mention a few outstanding examples, by Peruvian director Claudia Llosa in her films Madeinusa (2005) and The Milk of Sorrow (2009), and by Jayro Bustamante in Guatemala in Ixcanul (2015). Each of these three films won international awards, are partially spoken in indigenous languages and featured non-professional actresses of indigenous origin. Despite the historical fact that the subaltern female in conditions of servitude or slavery has rarely contested power through confrontation, it cannot be said that those groups have not exercised, in their own way, a counter and ‘soft’ power. Along these lines, something might be politically wrong with the fact that Roma’s maids seem not to exercise much power towards their patrons and within the domestic sphere – the situation might verge on victimism and is quite unrealistic (there is even a popular joke in Mexico that maids are the real bosses). In contrast, the film succeeds in conveying the patronising aura behind most of the gestures of love the family makes towards Cleo. When Cleo falls pregnant, Sofía, the mother, sympathises with her and Cleo does receive good medical care because of the connections the family has with health professionals (Sofía’s husband is a doctor), but when Teresa, the grandmother, takes Cleo to buy a cot for her baby, it is demonstrated that she is ignorant of both Cleo’s age or her surname. The children constantly tell Cleo that they love her, but they never stop asking her to serve them in some way. Later, Cleo suffers a traumatic stillbirth and Sofía pretends to take her to the beach with the family to overcome her trauma, but in reality Cleo does not stop working and she even ends up saving two of the children from drowning in the sea even though she herself cannot swim. So, to some extent, Cleo’s character is certainly short of agency, yet the critiques that find that Cuarón is merely using her as a blank canvas are somehow schematic. Richard Brody, in his review of the film, presents Cleo as ‘deprived of discourse’ and considers that the film turns her into a stereotype. Ignacio Sánchez Prado argues that it is precisely because of the former that the film is successful in presenting the very drama behind the story: ‘A film in which Cleo “had a voice”, whatever that could have meant, would altogether miss the point of her constant dehumanization.’  According to Sánchez Prado, there is a constant subjective erasure and dehumanisation of Cleo that is directly related to her role as a servant. Olivia Cosentino, meanwhile, has stressed the effectiveness with which Roma asserts in conveying the central issue of ‘emotional labor’, a term coined to refer workers’ curbing and projection of emotions with the aim of inducing particular feelings in the client, or, as in this case, in the patrons. As Cosentino remarks, Cleo constantly avoids creating any discomfort for Sofía, who often uses her as a ‘punching bag’ to vent the frustrations of her broken marriage. Cosentino poses an interesting twist by suggesting that Cleo’s silences must be read as more revealing than what the character effectively says and performs, so the author encourages reading those silences as vivid and telling gestures instead of mere blind spots throughout the film. As a Mexican who has personally experienced the power relations as portrayed in Roma, I find Sánchez Prado and Cosentino’s reflections highly productive, yet it might also be true that the film’s many subtleties around the complex dialectics of power–racism–affection could be confusing for non-Mexican audiences, and thus any analysis requires some further elaboration. In spite of Sánchez Prado’s assertions about the utter ‘desubjectification’ of Roma’s protagonist, I consider that the film does present Cleo’s subjectivity, but only focuses on it insofar as it is related to the expanded field of action of her work and human relationships. Richard Brody has said that the screenplay makes only vague reference to Cleo’s life in her village, her childhood or her family. However, the film does achieve the creation of some subjectivity when, for instance, it captures the playful fellowship and youthful complicity between Adela and Cleo that is based on their shared ethnicity. Whether at work or at leisure, the two young women chat recurrently about their dating (whether in their hometown or in the city), and they share opinions about their patrons (the grandmother’s miserliness, their love for the kids) or simply share a joke. Cleo’s boyfriend, Fermín, is actually Adela’s boyfriend’s cousin, and it is in a chat between the two girls that the sole reference to Cleo’s family is provided (when Adela mentions that Cleo’s mother’s land is being confiscated). Perhaps quite local, music is another relevant element for setting the character’s subjectivity. The film’s soundtrack is full of highly endearing, grassroots Mexican themes from the 1970s, which were more likely to be listened to by Adela, Cleo and Fermín than by Sofía and her circle. Most of the film’s diegetic music corresponds to Cleo’s preferences that, remarkably, she is recurrently heard singing or humming. 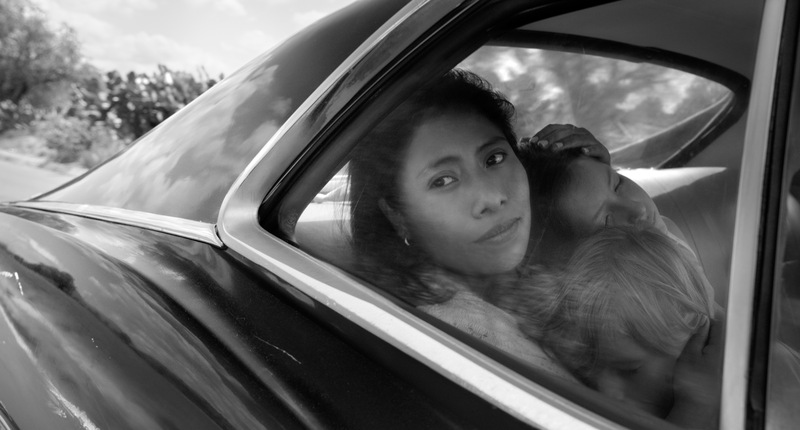 In cinematographic terms, and despite the fact that Cleo herself hardly speaks throughout the film, Roma is mainly narrated from her side of the story. In many sequences, she looks at something and the camera follows her eye, yet her subjective gaze is never fully established since there are few point-of-view shots. Nonetheless, even if the cinematographic language does not provide Cleo’s inner-psychologic viewpoint (the character’s development is mainly contextual), this does not mean that the character is utterly desubjectivated. The abundance of tracking shots serves to catch Cleo’s movement around the house as she carries out her endless duties whilst the family’s privacy takes place in the background. Significantly, the viewer is led to identify with Cleo, since the directing allows one just to see and hear what the character does; it is in this way that Cleo’s relation with the domestic space and the exclusion that she suffers are experienced by the audience. When Sofía and her husband are arguing, for example, the camera does not enter into the couple’s room. Instead it tracks Cleo’s descent as she makes her way down to the ground floor and then it makes a 360-degree pan to register her last working round of the day. The same happens when Sofía, locked in the toilet, is talking to a friend on the phone about her husband’s younger mistress. We can only hear Sofía’s voice, while the camera focuses on Cleo as she polishes a table and then as she tries to stop the eldest child as he sneaks towards the door to spy on his mother. The sequence ends when Sofía becomes aware of the presence of her son and slaps him, only to immediately regret the action; notoriously, she thereafter scolds Cleo violently and claims that Cleo should have prevented the incident. Cleo remains quiet while her patron yells at her, then leaves the room when Sofía orders her to do so. The whole situation eloquently summarises the dialectics of Cleo’s role within the family: although her presence is much needed, she is required to act phantasmagorically. Sequences of this kind take place on a regular basis during the film and are highly effective because they simultaneously provide information within and outside the diegesis while subtly showing the broader context of the house, the family, and ultimately of Mexican society at the time. So by the time Roma’s fiction is set, Mexico had already begun to face the disenchantment of its illusory and short affair with modernity. Cleo’s story is ultimately a story about the downfall and unevenness of a never-achieved modernity. She herself belongs to the immigrants who have left the countryside, and her family presumably faced the failure of the agrarian reforms of the 1910 Mexican Revolution. Her boyfriend Fermín had been a needy child and drug addict who had overcome his addiction through practising martial arts and now lives on the city’s outskirts. Cleo’s visit to Fermín allows the viewer to perceive the contrast between the Roma neighbourhood where Cleo works and the shantytown Ciudad Nezahualcóyotl where Fermín lives. Tellingly, the plot manages to make Fermín a part of the poor young men who were used by the government to repress student demonstrators in the infamous Corpus Christi massacre that took place in 1971. These riots are also portrayed in the narrative of Roma, when Cleo and the grandmother Teresa are buying a cot for Cleo’s baby. In fact, Cleo’s miscarriage occurs while they are in the store, when some wounded students enter the store to take shelter and the paramilitaries follow them there and threaten the clients (it is actually Fermín who points a gun at Cleo, causing her waters to break). Unobserved by the critics, yet masterly summarising the aforementioned dilemmas of Mexican modernity, a set of powerful sequences of Roma takes place in Centro Médico, a huge hospital complex built in Mexico City in 1951 as part of the desarrollista policies referred to above. This is where Cleo receives her pregnancy healthcare and where Teresa takes her when the miscarriage occurs. The grandeur and architectural rhetoric of the building – with its murals by David Alfaro Siqueiros – are emblematic in Mexico City and embody the wish for social justice typical of a time already passed when Roma’s narrative takes place, but whose leftovers still remained in the 1970s. During Cleo’s first visit to the hospital an earthquake happens, and she witnesses an incubator preventing a baby from being killed by a fragment of the falling roof. It is a powerful image, a revealing metaphor of the technological advances precariously safeguarding people from the fatalities of telluric forces. Also set in the hospital, Cleo’s labour sequence is emotionally very tense: the doctor’s attempts to revive the stillborn baby fail, but Cleo is allowed to embrace her daughter’s corpse for a last farewell. Later, the trip to the beach occurs. Just after rescuing two of the children from drowning, a drenched and gasping Cleo cathartically admits that she never wanted her baby to be born anyway. It is as if the whole violent failure of Mexican modernity happened through Cleo’s exhausted and maltreated body. It is also during the vacation to the beach that Sofía tells her children about her divorce from their father and announces her new role as the family’s leader and breadwinner (the father has refused to give her money and she has found a job as an editor). In this regard, Ignacio Sánchez Prado quotes the comment scholar Natalia Pérez made on Facebook that there is a nod in Roma to the idea that the emancipation of middle class women relies on the exploitation of women such as Cleo. 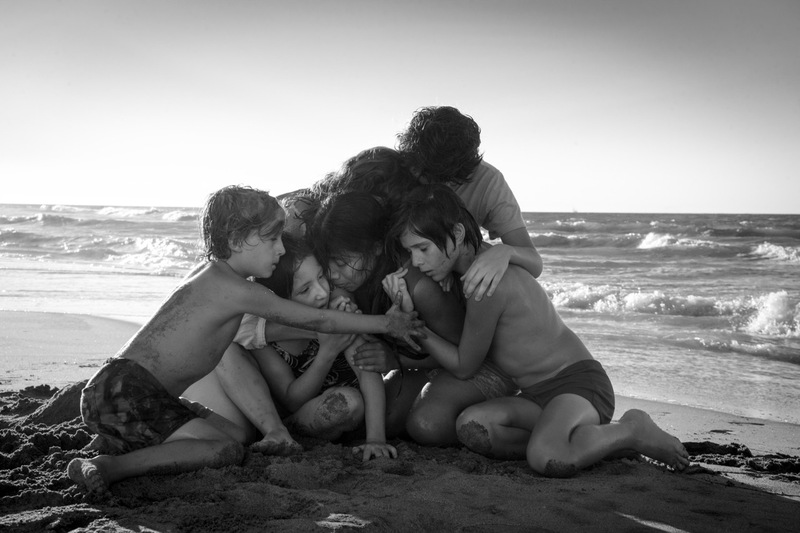 Ultimately, and as Sánchez Prado points out, Roma’s story clearly illustrates the way in which the privileges attained by those who could access modernity rely on the losses of the many others who could not do so. At the end of the film, Sofía, Cleo and the children return to Mexico City. Once back at home, the family relax and tell Teresa about Cleo’s heroic gesture in the sea. Meanwhile, the maid has already gone back to her never-ending house duties and little Sofi demands her milkshake. So both Sofía and the whole family are aware that they literally owe their lives to Cleo. But that doesn’t change anything: the old structural power relationships between them persist unaltered. Things have changed little in Mexico. Inspired by Mark Dery’s notion of ‘Afrofuturism’, the writer Alberto Chimal has coined the term ‘Mexafuturismo’ in an essay devoted to speculating about Yalitza Aparicio’s professional possibilities in Mexico in the near future. Chimal makes reference to social media debates in which people have remarked that, if Aparicio does continue to act there will be few opportunities for her in mainstrean Mexican cinema, where production is still centred on white characters and actors. According to the author, Aparicio thus risks being typecast in roles as maids or peasants, or she could be much more likely to be cast in science fiction or fantasy films: ‘scenarios where exclusion and racism do not exist or can be confronted and overcome only figuratively, as in Guillermo del Toro’s The Shape of Water (2017)’. Chimal also recounts the way in which American cinema has incorporated Afrofuturism through films like Black Panther (2018) or Star Wars: The Force Awakes (2015) and The Last Jedi (2017). ‘Mexafuturismo’, Literal: Latin American Voices, 12 February 2019 http://literalmagazine.com/mexafuturismo/?fbclid=IwAR1UZFHB3kQwTN0hUzo5pUs1-YLOZ_UGI21lqlyUE55mmPym18ittCJcur4 (last consulted on 16 February 2019, translation of the quote is my own). While I was writing this review, news was released that Rossana Barro, a coordinator of the Mexican Film Festival of Morelia, had exposed a plot by Mexican actresses to keep Yalitza Aparicio out of the running for the Ariel awards (the Mexican Academy of Film’s awards and Mexico’s equivalent of the Oscars). Although the alleged conspiracy clearly seems to have a racist basis, the group of actresses argued that Aparicio’s lack of acting training was the main reason for their claim. ‘Acusan a actrices mexicanas de boicot contra Yalitza para que se quede sin Ariel’ (‘Mexican actresses accused of boycott against Yalitza to prevent her winning an Ariel’), Milenio, 12 February 2019 https://www.milenio.com/espectaculos/premios-oscar/acusan-twitter-presunto-boicot-yalitza-aparicio (last visited on 16 February 2019). A video was also released in which the Mexican actor Sergio Goyri expressed his disagreement with Aparicio’s nominations, referring to her with the pejorative expression ‘pinche india’ (equivalent almost to ‘damn Indian’). ‘Difunden video en el que Sergio Goyri insulta a Yalitza Aparicio’ (Video released of Sergio Goyri insulting Yalitza Aparicio), La Jornada, 16 February 2019 https://www.jornada.com.mx/ultimas/2019/02/16/difunden-video-en-el-que-sergio-goyri-insulta-a-yalitza-aparicio-4277.html (last visited 17 February 2019). I agree with Slavoj Zizek’s remarks about Cleo’s ‘ideological blindness’, but Zizek’s review of Roma is, however, focused on class and ideological topics, and thus overlooks the debate around power, affection and subjectivity, three issues that I consider to be the core issue of the film. ‘Roma is being celebrated for all the wrong reasons, writes Slavoj Zizek’, The Spectator, 14 January 2019. On 10 June 1971 (coinciding with the day of the Corpus Christi festival) a massacre of student demonstrators took place in Mexico City. The background of the riots can be traced back to 1968, when a movement of students began to demonstrate dissatisfaction with the government, forging alliances among workers and the marginal urban poor and challenging the political regime. In 1968, student demonstrators were killed by the Mexican armed forces in the Tlatelolco Massacre (so called because it occurred in the Plaza de las Tres Culturas in the Tlatelolco area of Mexico City). The events are considered part of the Mexican Dirty War, in which the government used its forces to suppress political opposition. The Corpus Christi massacre is also known as ‘El halconazo’ (the ‘Hawk Strike’) because of the participation of a government-trained paramilitary group known as the Hawks. In Roma, Fermín is presumably part of that group. Diana Cuéllar Ledesma is originally from Puebla, Mexico, and was awarded her PhD in Artistic, Literary and Cultural Studies from Universidad Autónoma de Madrid. She is a freelance curator, and the Madrid correspondent for ArtNexus magazine. Her interests include the relations between art and society in Latin America, with a particular focus on indigenista cinema.